Old Vox Blog, originally uploaded by workingyarn. I guess it’s official. For four years, I had a Vox blog (knifty.vox.com) with lots of visitors, but Vox decided to close down by the end of September. As a concession, they offered a new Typepad blog, and I’ve been here for a week or so, and I like it just fine. 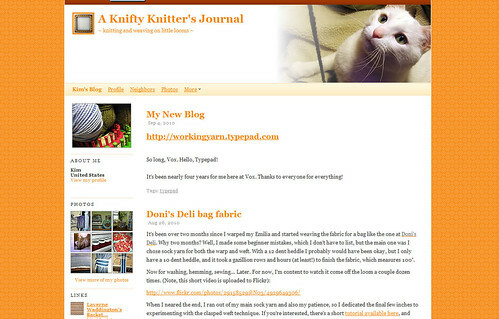 So long, cute orange blog.